DOZENS of Mamoral residents were stranded yesterday as rising floodwaters made roads leading to their homes impassable. Shawn Samuel, an employee of the National Lotteries Control Board said he left Port of Spain earlier than usual after a relative told him water was flowing across the bridge at Durham Mills Road along the Caparo Main Road at around 2pm. Samuel said when he got to the bridge, the flood was already over four feet high. When Newsday met Samuel around 5pm, the water was still rising. “I thought I could reach home in time but I get stuck here now, no vehicles can pass through that water so we have to wait it out,” he said. 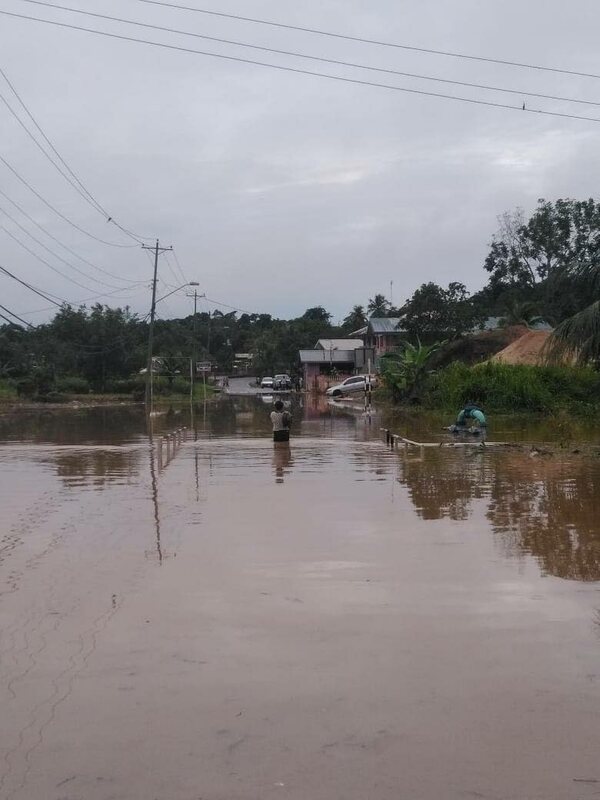 With incessant rainfall yesterday morning, the Caparo river burst its banks around noon, leaving residents scrambling to secure their homes and vehicles. Another Mamoral resident, Anand, said after learning about the flood, he stopped at a doubles vendor and purchased dinner for himself. Leaning against his car, Anand said he was accustomed to waiting out floods. “A few years ago, I slept on an empty rice bag in the grocery because the water wasn’t going down. “I know what I coming to meet so I buy a few doubles for myself because I know I will have to wait here until about 2o’clock in the morning. On Divali day last year, dozens of homes in Caparo were flooded after heavy rainfall. Ramsubag Ramoutar, 69, who lives in Carr Road, Caparo said the flood cost him approximately $100,000 in damage. Days later, he spent $4,500 to have a flood-proof gate built and installed in front of his house. As the water continued to rise yesterday, he said he was hopeful that the gate would be able to protect his home. Other residents used a paste of mud and water to try to seal off doorways and gates to prevent the flood water from entering their home. All of the residents this reporter spoke to said a failure by the relevant authorities to dredge the river was to blame for the floods. Reply to "Drivers wait it out as Caparo floods"